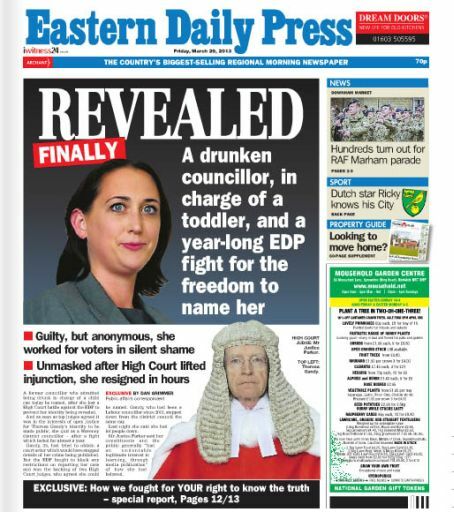 Last May, a councillor in Norfolk pleaded guilty to being drunk in charge of a two and a half year old child in front of a bench of magistrates. Fast forward nearly 12 months and that court case has only just been reported. And not only has it been reported in the local papers as you would expect but it has also been covered by the majority of the mainstream national press. What happened in the intervening period to make this case so interesting to people who have never heard of this councillor before and have never had to decide whether to vote for her or not? The tale really begins at the magistrates’ court hearing, where this councillor’s defence barrister applied for a Section 39 (Children and Young Person’s Act 1933) Order. As you know, this kind of Order is designed to protect the anonymity of children who are concerned in criminal proceedings. However, in her submissions, the barrister primarily asked for the Order to be made because of the effect reporting would have on the adult defendant. The barrister made reference to the impact on the child but only in a very general way. The magistrates’ legal advisor pointed out that the magistrates did not have to consider the impact on the defendant, just the potential effect on the child (who was very young) and the magistrates retired to consider the application. Upon their return, they dismissed the councillor’s application, refusing to grant the S. 39 Order. Not so remarkable so far but here’s where it gets interesting. Rather than accepting the Magistrates’ Court’s decision, the very same day, the councillor obtained a high court injunction which prohibited the reporting of anything about the case which would identify either the child or the councillor herself. The purpose of this injunction was to maintain the status quo whilst she pursued a Judicial Review of the Magistrates’ Court’s decision. Archant, the publisher of the Lowestoft Journal and the Eastern Daily Press, decided to intervene in the Judicial Review and I acted on its behalf. We contended that the local community had a right to know what an elected official had done. The press had an Article 10 (of the European Convention of Human Rights) right to identify the councillor and the public had a corresponding right to receive that information. In these circumstances, that Article 10 right was strong enough to take precedence over the competing Article 8 right of the child (right to family life and privacy). The important and long-established principle of open justice recognises the right to report proceedings in the criminal courts and identify those who commit crimes. The Judicial Review was held in the Royal Courts of Justice and presided over by two senior Judges. “The Eastern Daily Press and the Lowestoft Journal seem to me to have a powerful case indeed,” said Mr Justice Kenneth Parker, in his judgement. So it followed that the councillor’s application was dismissed by the court. The councillor’s name is Teresa Gandy. I can only tell you that because Archant took a principled stand and fought against Mrs Gandy’s attempts to stop her case being reported. More importantly, the people who voted for her and who she represented also now know. Significantly, within two days of the Judicial Review being dismissed, she announced her resignation. And the child? Legally, I could tell you the child’s name, but I’m not going to, because this story was never about the child. It was only ever going to be story about an elected official committing a criminal offence in her local Asda cafe. Now, it’s a story about an elected official committing a criminal offence, then apparently trying to cover it up but ultimately being thwarted by a regional newspaper publisher – and that’s a much more compelling story. The Eastern Daily Press was finally able to report the case after a year-long fight. Congratulations to the newspapers concerned. Very well done! However, I would be interested to know who is footing the bill for this woman’s legal costs and for those incurred by the papers. Will she be ordered to pay them herself? Unlikely. Will she attempt to offload them onto the local council? We should be told.